Five practices into preseason camp – including the first in full equipment Wednesday, the LSU quarterback situation is no clearer. At his post-practice press conference Wednesday night, Orgeron said that there is nothing different to report about the quarterback competition. “It is too early for any quarterback determination,” Orgeron said. “These guys continue to compete. All four of them have had their good moments. Either Justin McMillan or Brennan has taken the first rep in drills while members of the media have been at practice. However, no team periods are observed by the media. 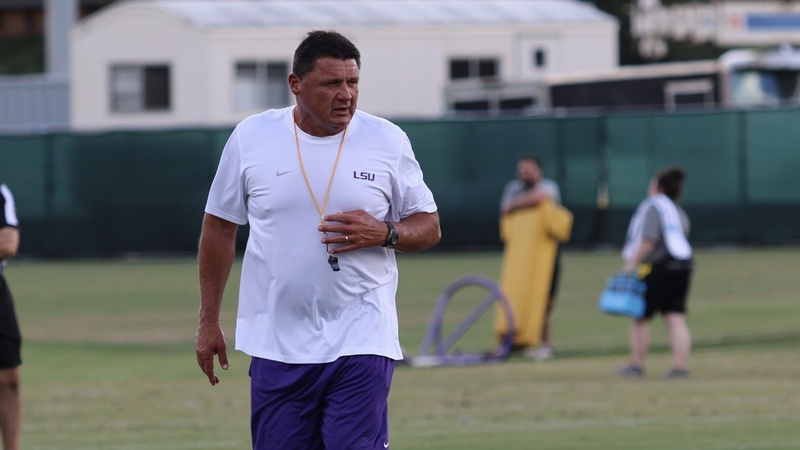 According to Orgeron, the defense was dominant during Tuesday practice. Orgeron then said that the offense bounced back Wednesday. Here are some other comments made by Orgeron about different positions. Freshman Ja’Marr Chase and Terrace Marshall were singled out. According to Orgeron, offensive assistant Jerry Sullivan believes Marshall “is getting better.” Stephen Sullivan made catches in the red zone. Clyde Edwards-Helaire and Chris Curry were identified by Orgeron as backs who stood out. Orgeron said, “Curry can play for us this year. He has speed and tenacity.” He also mentioned that Tory Carter can catch the ball out of the backfield.